Cibolo, Converse, Helotes, Kirby, Leon Valley, New Braunfels, Olmos Heights, Schertz, Shavano Park, Stone Oak, Universal City, Windcrest, and more. 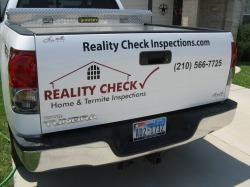 We also serve the following counties: Atascosa, Bexar, Comal, Guadalupe, Medina, Travis, Hays, Wilson, and more. We offer an objective, unbiased opinion on the condition of the property. I will inspect your future home as if I were purchasing it for my family. Home Sellers: Having a Pre-Listing Home Inspection can help you avoid time consuming repairs and treatments, which may prolong the selling process. New Home Warranty Inspections: Builders typically provide their new homes, a one or two year warranty against construction defects and other issues. It is up to the buyer to ask the builder for needed repairs. Often times it is advisable for the home owner to document these problems and make sure the builder performs the repairs properly. Condo and Townhouse Inspections are performed to the same high standards as our single family home inspections, but with several important differences. We generally do not have access to the roof and have only limited access to the foundation areas. The maintenance and upkeep of these and the common areas are usually the responsibility of the home owners association. The interior structure as well as the electrical and plumbing items are inspected as with any home. Investor Inspections & Forclosure Inspections can pose a different set of challenges. To perform the most complete inspection possible, the water, gas and electricity should be on. This is sometimes not practical or it may not be possible, if the plumbing or electrical systems are damaged or missing. Historic Home Inspections Historic Homes found here in South Texas are beautiful, one of a kind properties. When they are properly restored and maintained they can be as comfortable and safe as any new home built today. If the restoration or maintenance was not done correctly, you could be buying into a very expensive Money Pit. Back in thier day these homes were constructed with top rate craftsmanship, materials and state of the art technology, but by today's standards these same major systems can be old, outdated and potentially unsafe. You are fully protected by E & O Insurance. We exceed the Standards of Practice required by TREC (Texas Real Estate Commission). We offer clear, professional communication to you and your Realtor®. We understand that most real estate transactions are time sensitive, we will, in most cases, deliver your report via email within 12 hours. Your Home Inspection Report will be in a PDF file, easy to understand that includes digital photos that detail your new home's condition.